We believe a successful software development solution should not force the users to change entirely the way they work, on the contrary it should gel with the current practice and lead users to achieve the most with a slight shift in their working model. 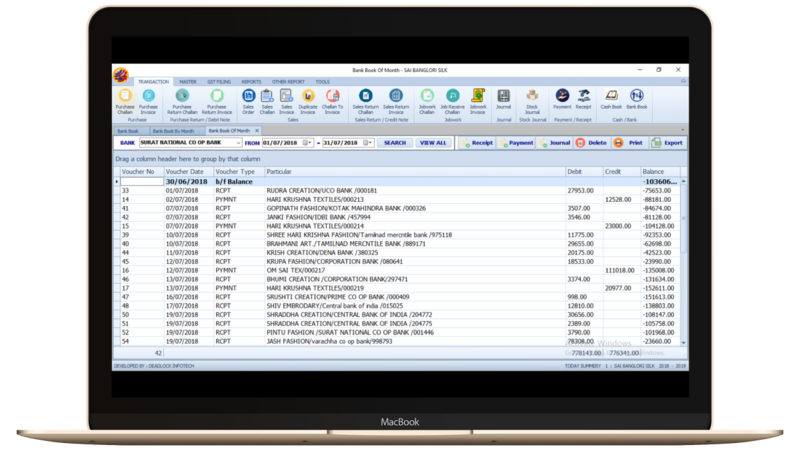 All business transaction recorded and manage in one software application. It give live status of your business transaction and outstanding. Auto send email with invoice copy and all item image which recorded in invoice. You can upload party image, product image, invoice and other. Giant Accounting is a comprehensive, secured and compatible ERP solution for an organization. 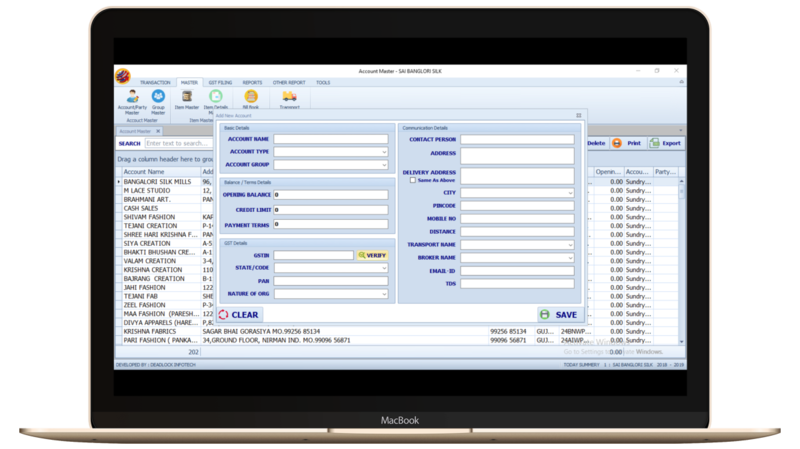 This is a desktop based solution for accounting, inventory, sale, purchase and party management. Giant is a convenient solution made upon the aspect of your business operations. It offers financial solution which meets the business demands and provides integration of several other aspects of business. We provide latest UI technology of DevExpress and Microsoft .net technology. We provide lots of inbuilt theme, color and background for your software design. .
All form of software are truly fully responsive for your screen resolution. You can test all transaction of your business at any time with Giant Accounting. Managing complexity, mitigating risks, and controlling costs have become increasingly important factors for organizations considering their IT strategy. For general purpose of application is so, easily use for your small scale business like cloth store, mobile shop, electrical shop, fashion jewellery and many more. For general purpose of application is so, easily use for your big factory, looms factory, labour work business and many more.They also have a all type of reporting with detail and summary. All account transaction daily work, daily withdraw, monthly salary and have also master module for all and customise report. A marketing information system (MKIS) is a management information system (MIS) designed to support marketing decision making.Developing a marketing information system is becoming extremely important as the strength of economies rely on services and to better understand the specific needs of customers. ERP provides an integrated and continuously updated view of core business processes using common databases maintained by a database management system. 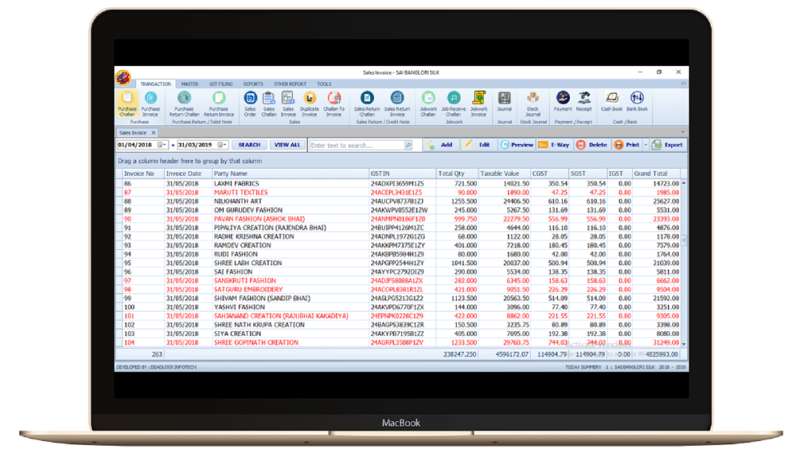 ERP systems track business resources-cash, raw materials, production capacity-and the status of business commitments: orders, purchase orders, and payroll. Continually network virtual strategic theme areas vis-a-vis ubiquitous potentialities. Holisticly negotiate focused e-tailers without premium solutions. We understand that every business has its own complexities, exceptions and unique needs. Giant Accounting is designed with flexibility to handle all of these. All type of inventory management are included in Giant Accounting Like FIFO, LIFO, Average Rate and also different with invoice and challan. 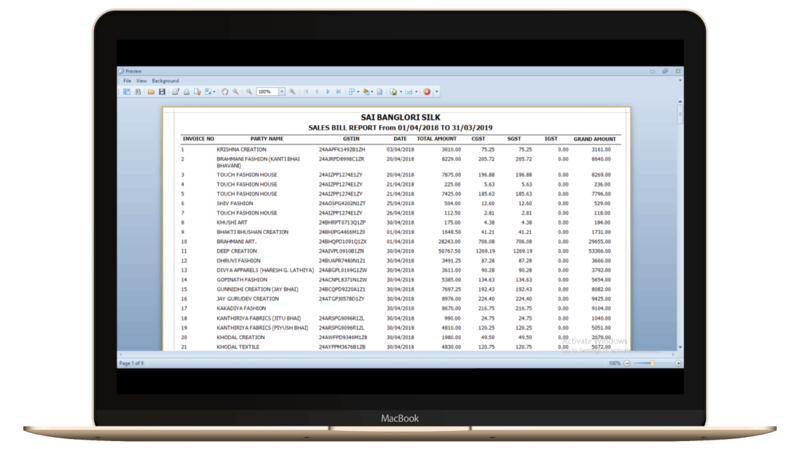 You can manage all Sale, Purchase, Debit note, Credit note, Challan and Invoice entry and also you manage out jobwork and inward jobwork entry . You can easily manage All Party and also filter by all field like Firm, Party Name, Address, GSTIN, State, City, Broker, account group wise and etc.. .
All report are listed in Giant Accounting like Outstanding, Ledger, Stock, Purchase, Sale, GST Report, GST Ledger, all financial report and more. All kind of charts and chart type(Pie,Bar,Liner,etc) are included in Giant Accounting like Stock, Purchase, Sales, Profit, Ledger. Easy application, fast funding, and effortless payback. We have different type of pricing table to choose with your need with reasonable price. Any one you can choose that you need. Continually network virtual strategic theme areas vis-a-vis ubiquitous potentialities. Holisticly negotiate focused e-tailers without premium solutions. What our client say about our Deadlock Infotech company and our Giant Accounting software and our developer staff and support team. Paperless office solution, developed Giant helped us reducing stacks of files occupying valuable working space. It is saving staff time in retrieval of documents. Milan on Milan Mendapara & Co.
Our staff and Auditors are happy. As an Entrepreneur, I feel that every organiation should implement this and contribute to saving of environment. Devil Da on Infa IT Services ltd. 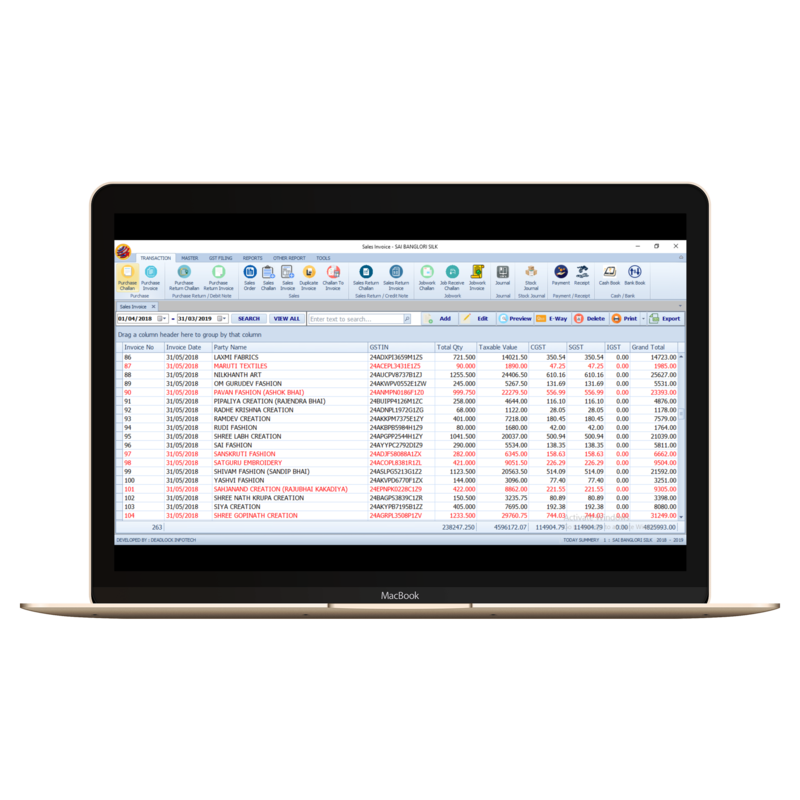 Giant Accounting is very user friendly and easy to use. It is also easy to get trained Company operator which makes a huge difference when compared to any other package. It is our accounting solution. 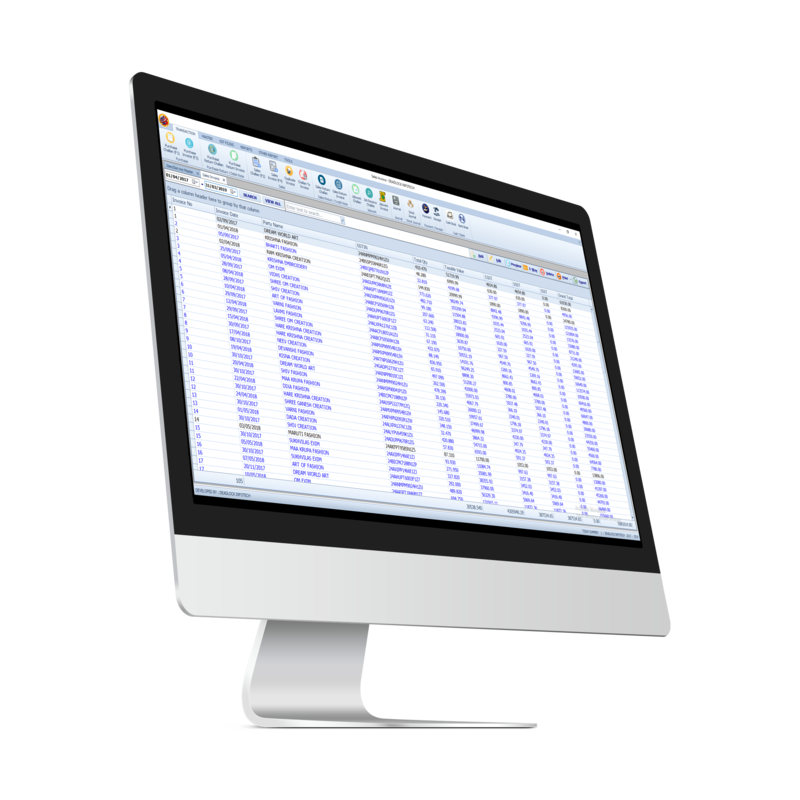 All of our quotes and invoices are generated through Giant Accounting. "The new user interface is too good, very easy to use and gives us instant reports. Business owners like us, can actually concentrate on the business rather than finance and accounting. Send a message or mail on our email-id for quick contact with us or call on our customer care number. It's very easy to get in touch with us. Just use the contact form or pay us a visit for a coffee at the office. 101, Ugam Chember, Hirabag, Surat -395006 , Gujarat, India. © 2018. Deadlock Infotech. All right reserve.